This is a House of Fun Guides & Tips for NewComers, optimize your game by learning the basics. How do I access and play the Wheel of Fun? The Wheel of Fun is actually a part of the 3-Hour Bonus. On every 5th collection, you receive a spin on the Wheel of Fun (instead of the regular collect bonus). Spinning the Wheel of Fun gives you a chance to win even higher amounts than your typical bonus! Click the SPIN button once you have the Wheel of Fun available. For each slot-machine, a specified number of symbols of the same kind needs to appear on a selected payline (active payline) for you to win. The lines can be horizontal or appear in a zigzag format and the valid line patterns, as well as the payout of each winning combination is always shown in the pay-table. All symbols pay left to right and on certain games right to left on active paylines, except for the Scatter and the Bonus symbols. All wins are multiplied by the perline bet, including bonus rounds. You can do that by navigating the BET arrows under the reels. What is a scatter in House of Fun Slots? The Scatter symbols activate Free Spins, in which you have a chance to win just as much as in a regular bet, but without spending your coins. The amount of Free Spins varies for each machine, but their bet value will always be the same as you were betting when the Scatter was activated. Some slot-machines can have the Free Spins retriggered (meaning that new Scatter Symbols may appear inside the free round, thus accumulating more Free Spins) and some slot-machines even have multipliers, which are applied to your total winnings on that round. Make sure to check out each machine's Pay-Table for accurate information on how to activate the Scatter, the amount of Free Spins you get and general rules. The Wilds are special symbols that substitute other symbols, except for the Scatter and Bonus, to help you achieve more winning lines. Some machines also have special Wild symbols called Expanding Wilds. When they appear, they expand to cover the entire reel replacing the other symbols, so your chances of winning are even higher! Make sure to check out each machine's Pay-Table for accurate information on the Wilds and general rules. House of Fun is a free-to-play game. As such, the game provide free coins to players in a number of different ways, including the 3-Hour Bonus. As its name suggest, the 3-Hour Bonus can be collected every 3 hours! Just tap the "Collect" button located in the lobby when your bonus is available. After collecting your bonus, the button will show a countdown timer indicating when you can collect the bonus again. What is the Bonus Game? The Bonus Games are usually multiple-choice rounds, played on a new screen that is displayed instead of the reels. Usually you get to pick one or more items containing coins or multipliers and proceed until the game is over. The activation of bonus games differs between machines and depends on the symbol locations on the reels. Some Slots can have Free Spins triggered inside bonus games and some even have multipliers, which are applied to your total winnings on that round. Make sure to check out each machine's pay-table for accurate information on the general rules of the machine and how to trigger the bonus game. Did your Bonus round session froze? No problem, House of Fun has a 24 hour restore session during which all your progress is saved. You simply refresh your game session by pressing the refresh button of your browser (or simply press F5 on your keyboard). After you refresh your game session just return to the game you were playing and it should start from where you left off. While playing House of Fun on a mobile device there are two game modes: One option is to choose to connect through your Facebook account and the second option is to choose a standalone mode, in which case you play outside of the Facebook platform. The only way to transfer your balance from one mobile device to another is by connecting both of them to Facebook. If you encounter difficulties connecting to Facebook, check to make sure that you have the latest version of the Facebook app installed on your device and that you are logged into your account. 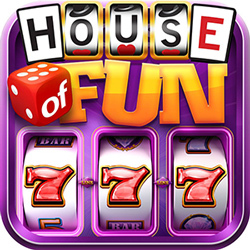 House of Fun Slots are programmed with a random number generator (RNG) that is activated with every spin. It is a complex mathematical algorithm which dictates an outcome that needs to be as random as possible. The moment you press the spin button the computer locks into a series of RNG numbers, using a mathematical equation which tells the reels where to stop. Each push of the spin button provides each player with an even chance at a winning configuration; however user experience may differ between players. All spins have the same probability of success or failure, regardless of the player, his or her level, how many coins he or she has, or how long they've been playing. Also, the machines cannot verify who pays or does not pay for coins, and therefore there is no correlation between paying or non-paying users and the payouts. Our slot machines are tested countless times by numerous parties running millions of rounds to insure that they are working properly. One suggestion is to keep your total bet at 1% of your total balance (make it higher or lower as you win or lose). Another option would be to try to change the game and chose another option from our large variety of games. The House of Fun Slots Bonus page on GameHunters.Club can be use to Collect Coins as much as you want. Did you notice that in Facebook you can collect free coins & spins from your friends? The House of Fun Slots Bonus page is a network of players where you can get extra bonuses without being friends with them on Facebook. Think of it as an extension of your Facebook Friends. You can help other players by sharing your bonus links to using the ShareLinks Plugin. getting the exrta coins and spins. I like getting the exrta coins and spins.